A banana liqueur and sweet ripe plantain. Is this a match made in heaven? Scoop the passion fruit flesh and seeds into a bowl, mix in 1 tablespoon of Galliano and set aside. Put the mascarpone, icing sugar and vanilla in a bowl, mix with a fork, cover and chill. Mix the honey and remaining Galliano in a small bowl. Cut the plantain in half lengthwise with the skins still on. With the tip of a knife score the flesh with deep criss-cross slashes, taking care not to go all the way through and not to cut the skin. Brush the cut sides of the plantain with about half of the honey mix and grill for 4-5 minutes on a medium heat, basting occasionally with the remaining honey mix until cooked through and golden. Thick plantain may take a little longer to cook. 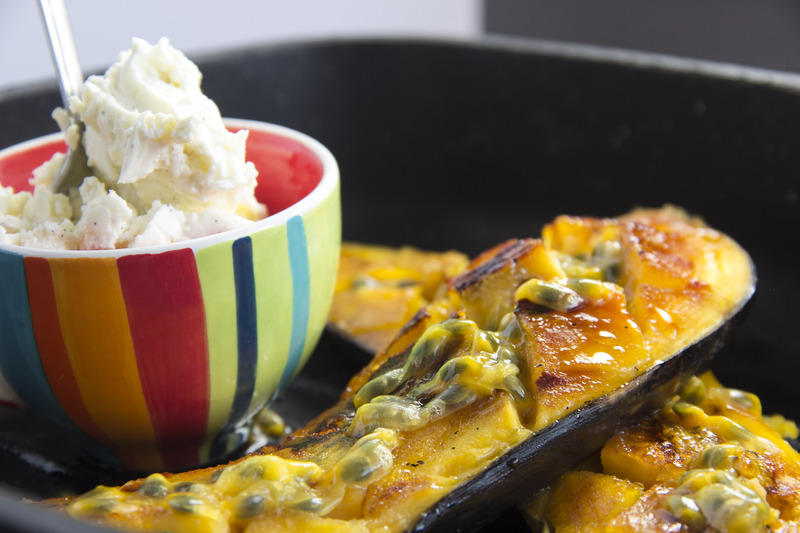 Serve in their skins with the mascarpone or a scoop of ice cream and drizzled with the passion fruit mix. No Replies to "Galliano, plantain & passionfruit griddle"